Shellfish specialists The Mother Shuckers are back, with a lunchtime & afternoon session in Notting Hill on Saturday 16th November, for 16 people each. These will involve a host of different crustaceans caught sustainably in UK waters, plus cocktails and Prosecco will be available. "Pull on your flippers and dive into a delicious platter of shellfish with The Mother Shuckers! 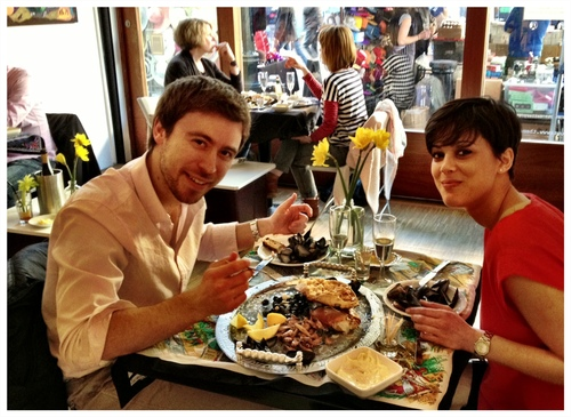 Oysters will be top of the menu, along with fresh English Crab & a selection of potted prawns, mussels, home cured salmon, clams, winkles or cockles, homemade sourdough & delicious mayo! (Depending on what our fishermen can supply sustainably on the day). And to help you find your sea legs, wash it down with a glass of Prosecco or our signature Bloody Mary. Hosted in one of our fave popup spots, a gallery on Portobello Road, guests can mosey down to the market and enjoy the buzz after stuffing themselves with fishy delights! What a Saturday. The Mother Shuckers are all about celebrating the very best seafood our coastline has to offer. Join them! "